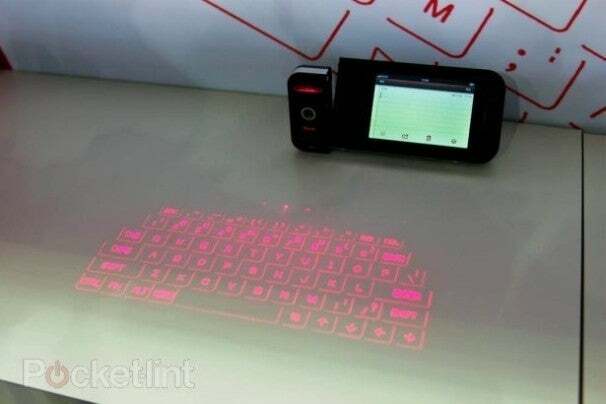 Celluon turned several heads during the last couple of years thanks to their unique laser projected keyboards. Specifically, the Magic Cube has been a hot ticket item for anyone wanting to escape the cramped confines of a touchscreen interface, due to its ability to create a full-sized typing tool on almost any surface. But for iPhone users who don't want the added clutter of another gadget, Celluon's pushing a new all-in-one solution -- the Prodigy. Tech blog Pocket-lint got some hands-on time with the Prodigy at CES, where the floor model was spotted in both white and black. As far as functionality, it's a three-solution problem for anyone who might find themselves in a situation where a lot of typing is needed and no laptop is in sight. Aside from the laser technology that creates the keyboard itself, the Prodigy boosts battery life and acts as a makeshift stand, like any good iPhone case should. Pocket-lint was able to test the new virtual keyboard at CES in Las Vegas and can report back that it works so long as you can type cleanly. What we mean by that is that, as soon as you start dragging your fingers, the system struggles to recognise your key inputs and types something else. Users might also find it hard to type without any tactile feedback. If people could get used to the tiny typing surfaces of devices like the touchscreen phones and the BlackBerry, moving back to a wider surface area shouldn't be much of problem once you get used to the precise typing motions required. Although the Prodigy reportedly won't work on a glass table or reflective surface, it should come in handy when your laptop's battery is dry and you need to work on a long flight. Now that the Magic Cube's technology can be incorporated into an iPhone case, perhaps the next logical step for Celluon should be integrating it into a smartphone... without an accessory? Either way, bear in mind that the Prodigy doesn't come cheap. Pocket-lint says the accessory will sell for 150 pounds, which is roughly 230 dollars in U.S. currency. For that price, you could buy just about any smartphone with a two-year plan and stick to the touchscreen.